Video Highlights: Cavaliers force Game 7, defeat Warriors 115-101 in Game 6 (2016 NBA Finals) - Balita Boss! 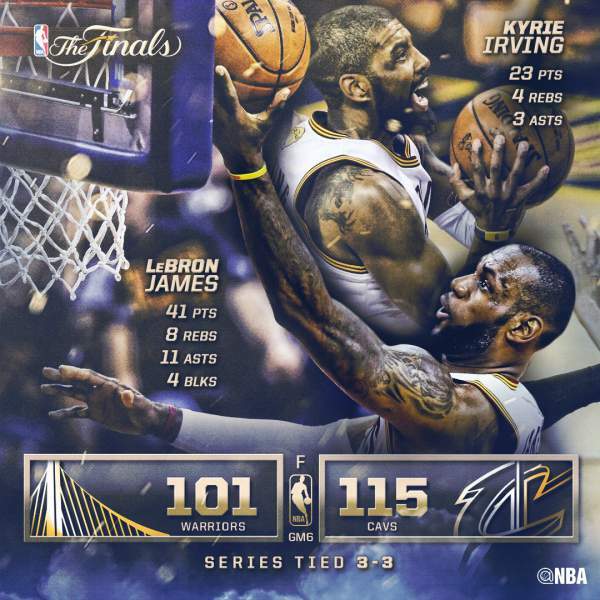 LeBron James scored 41 points for the second straight game to lead Cleveland Cavaliers to a 115-101 Game 6 victory over Golden State Warriors to force a Game 7 in 2016 NBA Finals. The four-time MVP had also 11 assists, eight rebounds, four steals, three blocks and just one turnover in 43 minutes. Tristan Thompson rose his level of play and made all six of his shots, scoring 15 points, grabbing 16 rebounds and dishing three assists. Kyrie Irving had 26 for the Cavaliers. Stephen Curry broke the NBA record for 3-pointers made in an NBA Finals series, scored 30 points for the Warriors, but was ejected in the fourth quarter after picking up his sixth foul. Klay Thompson scored 25 points but went just 3 for 10 from 3-point range. The Cleveland Cavaliers can create history on Game 7 by becoming the first team to come back from down 3-1 in the finals to win a title, the first Cavaliers team to get a championship and the first Cleveland sports team to win a title in 52 years. Game 7 is Sunday at Oracle Arena (Monday in the Philippines).